Brett Moist / For the Northwest Herald Crystal Lake Central's Jordan Wallace (left) hits the ball out of the hands of Prairie Ridge's Quarterback, Brent Anderson during the first quarterat Crystal Lake Central High School on Friday, September 21, 2012. Crystal Lake Central defeated Prairie RIdge 7-3. Brett Moist / For the Northwest Herald Prairie Ridge Quarterback Brent Anderson runs past Crystal Lake Central's Kyle Logan during the 1st quarter of gameplay against Prairie Ridge at Crystal Lake Central High School on Friday, September 21, 2012. Crystal Lake Central defeated Prairie Ridge 7-3. 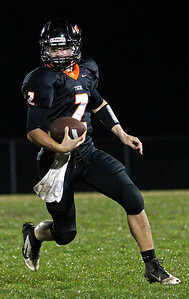 Brett Moist / For the Northwest Herald Crystal Lake Central Quarterback Kyle Lavand throws a pass during the first quarter against Prairie Ridge at Crystal Lake Central High School on Friday, September 21, 2012. Crystal Lake Central defeated Prairie Ridge 7-3. Brett Moist / For the Northwest Herald Crystal Lake Central's Kevin Peisker runs for a gain during the 1st quarter of gameplay against Prairie Ridge at Crystal Lake Central High School on Friday, September 21, 2012. 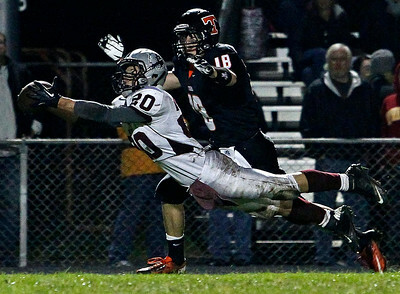 Prairie Ridge's Sean Folliard (left) made the tackle and Nathan Kirchberg (right) was in pursuit. Crystal Lake Central defeated Prairie Ridge 7-3. 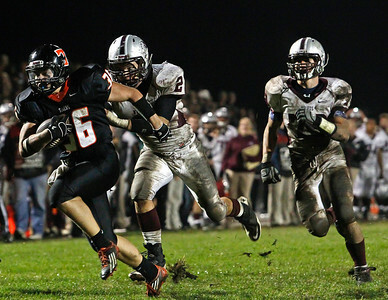 Brett Moist / For the Northwest Herald Crystal Lake Central's Tyler Jenkins runs past Prairie RIdge's Nathan Kirchberg (left) and Austin Nirva (right) at Crystal Lake Central High School on Friday, September 21, 2012. Crystal Lake Central defeated Prairie Ridge 7-3. Brett Moist / For the Northwest Herald Prairie Ridge's Robin Barcroft catches the ball for the interception 4th quarter of gameplay against Prairie Ridge at Crystal Lake Central High School on Friday, September 21, 2012. Crystal Lake Central's Luke Novy defends. Crystal Lake Central defeated Prairie Ridge 7-3. 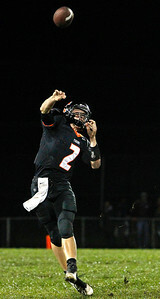 Brett Moist / For the Northwest Herald Crystal Lake Central Quarterback Kyle Lavand lead winning drive against Prairie Ridge at Crystal Lake Central High School on Friday, Sepetember 21, 2012. Crystal Lake Central defeated Prairie Ridge 7-3. Brett Moist / For the Northwest Herald Crystal Lake Central's Tyler Jenkins is tackled at the 1 yard line by Nathan Kirchberg (left) after a huge gain in the 4th quarter of gameplay at Crystal Lake Central High School on Friday, Spetember 21, 2012 Austin Nirva (right) was in pursuit. Crystal Lake Central defeated Prairie Ridge 7-3. 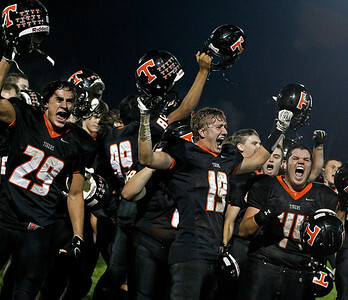 Brett Moist / For the Northwest Herald Crystal Lake Central's Brent Pfaff (left), Luke Francis (middle), and Alex Ibarra (right) celebrate their 7-3 victory over Prairie Ridge Friday, September 21, 2012 at Crystal Lake Central High School. Crystal Lake Central's Jordan Wallace (left) hits the ball out of the hands of Prairie Ridge's Quarterback, Brent Anderson during the first quarterat Crystal Lake Central High School on Friday, September 21, 2012. Crystal Lake Central defeated Prairie RIdge 7-3.